Please use this table as a guide only for the shipping of your order. When ordering multiple items, the shipping price may increase to the next size. Use our shipping calculator on the shopping cart page to confirm the cost of your order. This includes small homewares that can be shipped in a satchel or small box. These orders will be sent with a courier or in some cases Australia Post. Please provide an address where deliveries can be made during normal business hours, please note we do not ship to PO Boxes. We encourage you to track your order to ensure someone is home to accept delivery, or you may provide alternative delivery instructions at the checkout. Medium orders will be sent with a courier. Please provide an address where deliveries can be made during normal business hours. We encourage you to track your order to ensure someone is home to accept delivery, or you may provide alternative delivery instructions at the checkout. This delivery service is for furniture or bulky items that require special handling. Depending on the nature of the item you have ordered, this will be sent with a furniture carrier or courier. (Re-delivery charges may apply with selected carriers if you are not home to receive your order). 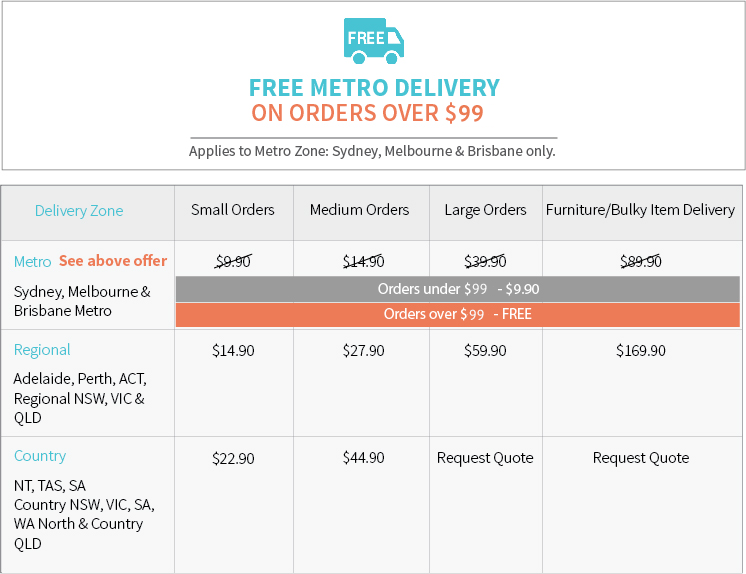 Metro Areas:In metro areas this will usually include a 2-man delivery service for heavy items, where you will be contacted to confirm a suitable day/approx time frame for your delivery. The furniture piece will be placed inside your home. For lighter bulky items such as dining chairs and coffee tables, this may be delivered with a courier service where you are able to track your delivery. Regional & Country Areas: A time-scheduled 2-man delivery service is not always available for regional and country areas. In this case you may be required to assist the driver with unloading your items. For lighter bulky items such as dining chairs and coffee tables, this may be delivered with a courier service where you are able to track your delivery We will contact you prior to delivery to advise what service is available in your area. Country/Remote Areas: If you are located in a country or remote area, you may require a delivery quotation for your order. Please contact us by phone or email or request a quotation. We deliver Australia wide, using a variety of different carriers depending on the size and location of your order. Some orders are dispatched from our warehouse and others directly from our suppliers. We aim to manage this process as smoothly as possible. Please provide a delivery address where deliveries can be made during normal business hours from Monday to Friday, 9am -5pm.We do not post to a PO post office address. We list the approximate product dispatch time on each product on our website. This time will vary depending on if the item is dispatched from our warehouse or our suppliers warehouse. Items will be dispatched from our warehouse in 1-2 days. Please take into account both the dispatch & shipping lead times. If a delay should occur, you will be notified by phone or email. You may provide delivery instructions at the checkout giving authority for your item in to be left at the front door or another safe spot (Order Comments field - step 5 of the checkout process). We recommend this option if you are in a hurry to receive your order, as if you miss a delivery you may have to arrange for a re-delivery with the couriers which takes extra time. Please note we do not take responsibility for loss or damage for orders that the customer has been given authority to leave. If your furniture is to be delivered to where there is restricted or difficult access, such as an apartment block, high rise or up or down stairs, you need to notify us. In some circumstances, additional shipping charges may apply. Please give us clear delivery instructions at the time you are placing your order in the Order Comments field (step 5 of the checkout process). Particularly for large items or furniture deliveries, some carriers charge re-delivery fees if the customer is not home to accept the delivery. Re-delivery fees are the responsibility of the customer. We aim to manage this as smoothly as possible by advising you when your item will be delivered, and provide tracking details where possible so that you can track your delivery and avoid any re-delivery charges. All orders require a signature on delivery. If authority to leave is given signature on delivery is not required. Please nominate a delivery address where the item can be delivered and signed for during normal business hours. You can also nominate to have your order delivered to your place of work or to a neighbor if you prefer. If you are located outside of Australia and wish to place an order, we may be able to ship to you, please contact us and advice your Country and post code with details of the pieces you are interested in. Our returns policy will vary depending on the item you purchase. Please check on the “shipping & returns” tab at the product page for the returns policy on your item. For items stocked in the Zohi Interior’s warehouse , “change of mind” return /exchange can be made for any reason within 14 days of receipt of your order*. Please contact us within 14 days of receiving your order via email only to info@zohiinteriors.com.au Please advise your name, order number, the product you wish to return and the reason for return. We will authorise your return and provide return shipping instructions. Items cannot be returned or exchange without prior notice and authorisation by Zohi Interiors. *exclusions apply: In some cases, Sale items will not be applicable for 14 day change of mind returns. Please check the shipping & returns tab on the specific item you are ordering. a) items that are directly shipped by our supplier (as we need to abide with our supplier’s returns policies) and b) items that are made to order cannot be returned/exchanged. Please check the return policy of your item on the “Shipping & Returns” tab on the product page for the item that you are purchasing. Once your returned item has been received, you will be offered the option of receiving a refund, exchange or store credit, which ever you prefer. If your payment was made online, you will receive a refund against your credit card or pay pal account. If your payment was made by EFT, cash or cheque, we will credit funds via EFT to your nominated bank account. We will notify you by email to confirm that we have processed your refund. Please allow 3 business days to receive your refund to our account. The value of your return will be the purchase price you paid less any shipping costs incurred. The initial delivery cost is non-refundable. You are also responsible to pay for the return shipping of your item. Please also note that if we have provided free shipping or discounted your shipping, you will be charged the actual shipping charges for the delivery of your order from our warehouse to your location. Please contact us prior to making a purchase if you would like to be advised of the return shipping charges. You are responsible for the return shipping of the item to the Zohi Interiors Warehouse. All items must be returned unused, in re-saleable and original condition. Items also must be returned in original packing and care taken with re-packing to avoid damage during transit. You may return your item using your own delivery carrier such as Australia Post or a courier. We recommend using registered parcel post and to include extra insurance for loss or damage. Alternatively we may organise for a courier on your behalf to collect the item from you. In both cases, you are responsible for the return shipping of the item, including re-packaging of the item, loss or damage to the item. Cancellations of orders are not permitted if an order has been placed with our supplier or if a courier has been dispatched to collect your order from our warehouse. Contact us immediately if you wish to cancel an order. Please check on the “shipping & returns” tab at the product page for the returns policy on your item you have purchased. Please see also our returns/exchange policy. We make a quality inspection of all orders prior to shipping them to you. If the item you receive is damaged or faulty, you must notify is within 24hours of receipt of your items by phone : 02 9580 2297 or by email: info@zohiinteriors.com.au. We also request that you provide digital photographs of the damage or faulty item. Once we have received your request we will we will make arrangements for the item to be picked up and a replacement item delivered to you at our cost. You will incur no additional costs. If a replacement item is not available we will refund you 100% of the purchase price and shipping costs. Please note that we cannot accept returned items without prior notification and authorisation code. All claims must be reported within 24 hours, to abide with our suppliers terms and conditions. Please contact us within 24 hours of receipt of delivery if you receive the incorrect item you ordered. We will organise collection and re-delivery of the correct item if available, at our cost. We aim to deliver the item to you within normal delivery time frame. If the item is out of stock we will refund you 100% of the purchase price and shipping costs. You must inspect your order for damages to packaging in the presence of the driver prior to signing for receipt of your order. If the item you receive is damaged on delivery, you must notify is within 24 hours of receipt of your items by phone: 02 9580 2297 or by email: info@zohiinteriors.com.au. In the event that the items have been damaged, please ensure you all have a record of the driver's name. If a package or box appears damaged, Please write 'PENDING INSPECTION' or 'APPEARS DAMAGED' on any documents the driver requests you to sign. We also request that you provide digital photographs of the damage item. Once we have received your claim we will make an assessment and reply by return email with our advice. We will make arrangements for the item to be picked up and a replacement item delivered to you at our cost. You will incur no additional costs. If a replacement item is not available we will refund you 100% of the purchase price and shipping costs. All returned items must be returned in original packing and care taken with re-packing to avoid damage during transit. Returned goods must be unused and in the original condition shipped to you. A late delivery does not constitute a breach of your agreement with us and will not entitle you to cancel your order. We will not be liable for any loss or damage as a result of a late delivery of your order.